Thanks @traceyrickard for my lovely new website. http://t.co/xTvX1xdapP. You're brilliant ! Interim roles in healthcare – director level roles in quality, strategy, integration, service improvement and transformation (usually about 3-6 months). Consultancy work – quality reviews, workforce reviews, profession specific reviews, design of integration models, set up of programme management structures. 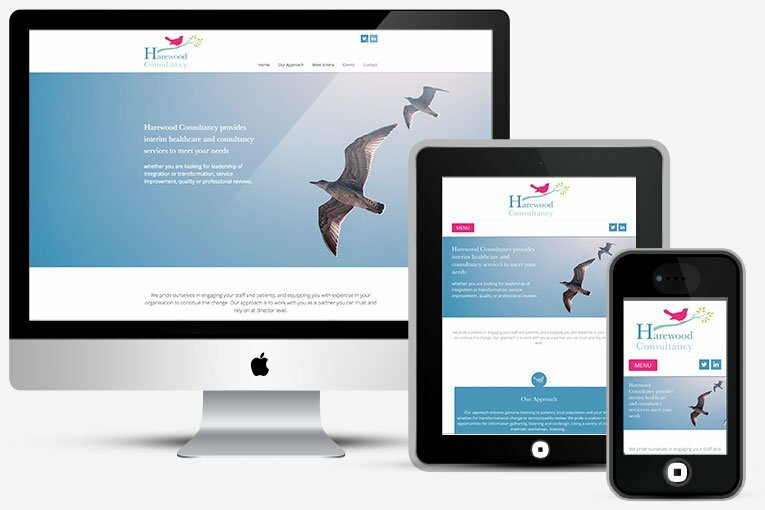 Emma wishes to promote herself online as an independent healthcare consultant and the new website will provide a professional front for the company. The website should promote brand awareness and raise the consultancy profile to a new audience of NHS organisations. The website should speak to specific areas within those including the HR team or members of the executive team or board. wider audience to attract new business. As briefed the design is intriguing and fun but remains professional. The target audience are mainly women and so it is slightly on the feminine side with a soft pink blue and green colours. The little bird in the logo was used throughout to create a theme. Emma was very keen to use the birds and in places I have used them to create a stencil effect. This is a custom designed website built on the WordPress platform, for easy editing and updating. I don’t use WordPress themes or templates, I design and build from scratch exactly to my client’s specifications and requirements. This is the best way to fulfil their complete wish list. I was told the other day that I am a Unicorn! definition: The unicorn designer is the most in demand and rarest of product team members — someone with excellent interaction design skills, visual design skills, and coding ability.